Hello, everyone! I'm back from my short break with a new skincare review for you. I've been testing two products from Derma e, the Hydrating Serum and Skin, Hair, and Nail Oil. Check out what they are supposed to do and how they performed after the break! Derma e Hydrating Serum is intended to both moisturize and smooth fine lines. I would say it is about half-way between a serum and a moisturizer. Deeply moisturize and replump skin to diminish the look of fine lines and wrinkles. This intensive treatment serum delivers a surge of water-loving nutrients deep within skin's surface. Contains Hyaluronic Acid, 'nature's moisture magnet' -- an ingredient that can hold up to 1,000 times its weight in water. Rich with antioxidant Vitamin C, skin-soothing Allantoin and healthy Panthenol, this formula leaves skin soft, smooth, healthy looking and rejuvenated. 100% vegan, cruelty-free, paraben-free, sulfate-free, mineral oil-free, lanolin-free, gluten free, GMO-free. Note that the product I am showing you here is in Derma e's new branding and packaging. Purified Water, Glycerin (Vegetable Derived) , Cetearyl Alcohol (Plant Derived), Ceteareth-20, Dimethicone, Sodium Hyaluronate (Hyaluronic Acid; Actimoist® Bio-1), Ascorbyl Palmitate (Vitamin C Ester), Ammonium Acryloyldimethyltaurate/VP Copolymer (Aristoflex®), Panthenol (Provitamin B5), Allantoin, Alanine, Leucine, Tyrosine, Glycine, Valine, Xanthan Gum, Potassium Sorbate, Phenoxyethanol, Ethylhexylglycerin, Fragrance. The ingredients are very gentle and it contains two that I know are very good on my skin - glycerin and hyaluronic acid, both of which moisturize well without clogging pores. Additional active ingredients include Vitamin C and Provitamin B5. Derma e Hydrating Serum comes in a pump bottle with clear plastic lid containing 2 fl. oz. The product is a light creme with a fresh, floral scent that dissipates immediately. How did it do? Fantastically! It was wonderfully light and moisturizing and caused no irritation or breakouts for me. During warmer weather, it will be a go-to moisturizer on its own. In colder weather I may need an additional moisturizer, but it still does fairly well. Next up is the Derma e Skin, Hair, and Nail Oil. This is a multi-purpose product for more intensive moisturization anywhere you need it. This is shown here in Derma e's older branding and packaging. What does the brand have to say? Restore a natural glow from head-to-toe with this all-in-one body treatment. Composed of 100% pure plant oils (organic Argan, Jojoba and Kukui Oil) this light, nutrient-rich beauty oil replenishes moisture for anti-aging skin benefits. Silky moisture helps fortify hair, boosting shine, softness and taming frizz. Deeply conditions dry, brittle nails and cuticles. Absorbs easily and penetrates deeply. 100% vegan, cruelty-free, paraben-free, sulfate-free, mineral oil-free, lanolin-free, gluten free, GMO-free. Organic Argania Spinosa (Argan) Kernel Oil* (98.0%), Aleurites Moluccana (Kukui) Seed Oil, Organic Simmondsia Chinensis (Jojoba) Seed Oil* (.5%). There are two ingredient lists currently, one for an earlier version and one for the product now on the shelves. The product I tested is the upper, current one. It has a mix of light, skin and hair friendly oils. The oil comes in a 1.1 oz dropper bottle made of plastic. So how did it do? It was a light oil with no added fragrance, and it absorbed into my skin extremely quickly - more so than for most cuticle oils. It was nicely lubricating without much lingering greasiness. It absorbed quickly into my face and felt nice, but I did get a tiny bit of acne with it, so if you are prone you might want to avoid it for facial use. Used in small amounts, it works well on hair as well. That wraps up my first beauty review of the year. 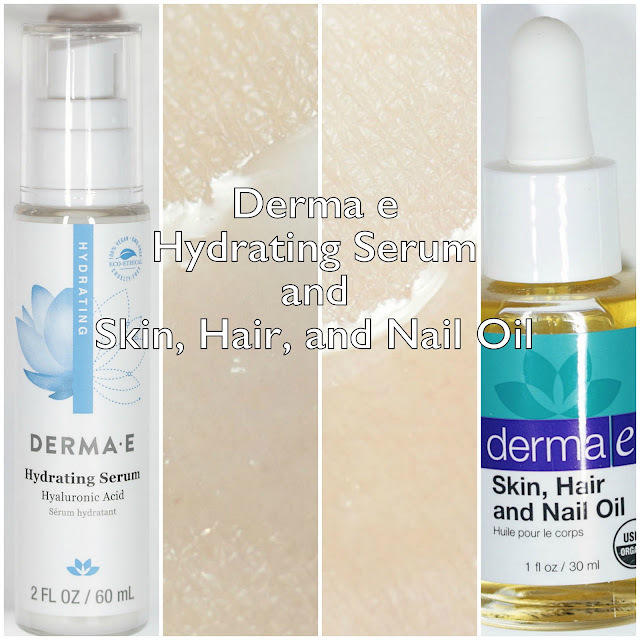 I was happy with both products, especially the Derma e Hydrating Serum. It retails for $29.50 for 2 oz. and the Skin, Hair, and Nail Oil sells for $15.00 for 1.1oz. I would say those a great deals for the quality and amount provided. Have you tried any multi-purpose oils yet? What do you think?